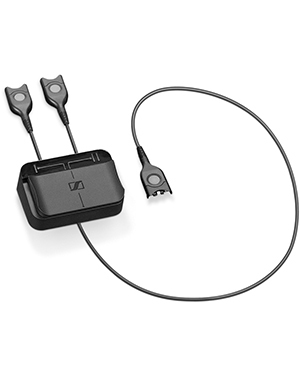 Sennheiser UI 812 Switch Box is an audio device that serves as an accessory for wired headsets. This box allows users to be able to answer calls from different devices using a single Sennheiser Easy-disconnect Headset. This box can be connected to a deskphone, PC/softphone, or smartphone, but it can only accommodate two different audio sources at the same time. This makes the device perfect for settings that cater to medium to large volume of calls daily, which include offices and contact centres. It is also great for companies and organisations who are thinking about transitioning towards a Unified Communications solution and how to do this transition in a cost-effective and smooth manner as possible. Sennheiser UI 812 Switch Box has plugs that are strongly structured, which withstand even with daily usage. The product is user-friendly and is guaranteed to be a future proof investment for the headset solution. Get to know more about this product and what it offers by dialling our hotline: Australia wide 1300 131 133! Headsetsonline Pty Ltd is a reliable company that sprung from being a new division of a well-known company that handles supplying and wholesaling of sound and audio products and solutions to corporate and government sectors since 1998. Currently, the company is able to offer the Australian market with wide variety of brand new and refurbished headsets, speakers, headphones, and speakerphones in high quality. Headsetsonline is able to garner the loyalty of its customers by ensuring two things- high quality and affordability. The company gets its products and solutions from reliable Australian distributors, staying away from grey imports, which mean that all items offered, pass Australian standards certification. In addition to being certified, all products from the company with warranties are also covered Australia-wide, wherever customers may be located all around the country. Headsetsonline provides affordability not just through the prices of its products and solutions but because of its flat shipping rates.